Was Crossfit First To Define Fitness? 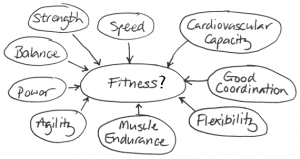 In October of 2002 Greg Glassman, the founder of Crossfit, put out an article titled “What is fitness?” That article has become the basis of the claims that Glassman invented the definition of fitness when no others had before him. This statement and the dozens of variations you’ll find across thousands of Crossfit-related pages has struck me odd since the first time I read it. In 1987 I first became a police officer. As such I was evaluated with a fitness assessment. I had to pass the assessment to move on to the next phase of testing. As part of that assessment I was tested for one-rep max-effort bench press, one-minute max-effort situps, 1.5-mile run, sit and reach and skinfold analysis of body fat. These tests were evaluations for fitness categories of: muscular strength, muscular endurance, aerobic endurance, flexibility and body composition. These fitness assessments were then a part of, and continue to be, a battery of tests measured, observed and repeated by the Cooper Institute in Dallas Texas. In Glassman’s 2002 article he lists the following as “General Physical Skills:” Cardiorespiratory Endurance, Stamina, Strength, Flexibility, Power, Speed, Coordination, Agility, Balance, and Accuracy. These “skills” have become the basis of the definition of fitness in the Crossfit culture. 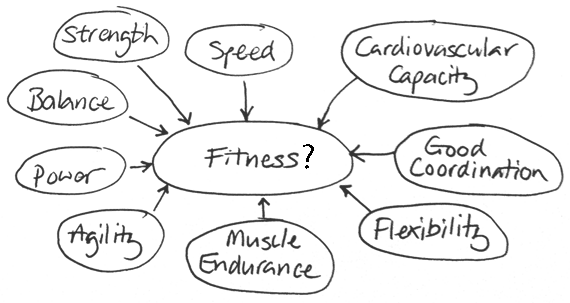 Ask most hard-core Crossfitters what fitness is and they’ll quickly share these 10 categories. I don’t have a problem with the 10 categories Glassman provides as parts of fitness. But to say that he provided them first is indisputably wrong. This one quote lists seven of Glassman’s 10 fitness categories (muscular strength, cardiorespiratory endurance, flexibility, speed, agility, balance and accuracy). It’s missing stamina, power and coordination. In the 1996 HHS report the authors modify the decades-earlier work and definition of fitness by removing muscular growth and adding body composition. In the 1996 HHS report they also define what tests are commonly used to measure the areas of fitness they propose are most important. One of the contentions in Crossfit culture is no one, prior to Glassman, had ever defined a way to measure, observe and repeat methods for evaluation of the fitness components. This, again, is indisputably wrong. Researchers have been studying tests of fitness for decades with importance given to their reliability and reproducibility. They have published their work in peer-reviewed journals also for decades. Beyond the 1996 HHS report which cites much earlier work in the field of fitness definition and assessment there is other widely-available, published work which predates Glassman’s 2002 article. One source is the YMCA Fitness Testing and Assessment Manual (2000). In that book the authors state “The four areas of physical fitness selected for evaluation in the YMCA Fitness Assessment protocol are body composition, cardiorespiratory endurance, flexibility, and muscular strength and endurance, administered in that order.” As with other work in this field the YMCA gives specific tests, based on research, that measure, are observable and are repeatably reliable. Then there’s Advanced Fitness Assessment and Exercise Prescription by Vivian Heyward, PhD. Dr. Heyward is a Regents professor emerita at the University of New Mexico, where she has taught physical fitness assessment and exercise prescription courses for more than 25 years. Extensively published, Dr. Heyward is the author of three previous editions of Advanced Fitness Assessment and Exercise Prescription (first work in 1997) as well as two editions of Applied Body Composition. Heyward has also written more than 60 articles in research and professional journals dealing with various aspects of physical fitness assessment and exercise prescription. Dr. Heyward has given numerous presentations at international, national and regional meetings of professional organisations in the field. Last, but not least, while I no doubt leave out dozens of other sources of fitness definers from decades ago forward, is Dr. Kenneth Cooper of the Cooper Institute in Dallas Texas. The Cooper Center Longitudinal Study (CCLS) is the principal research asset of The Cooper Institute. The data collection began with Dr. Cooper’s first patient in December 1970 with information meticulously recorded on index cards and stored in a shoe box. Dr. Cooper recognized the need for irrefutable research on fitness and activity and had the foresight to start developing a rich repository of health-related information. CCLS continues to expand each day as patients examined by Cooper physicians are added into the database. This database contains more than 250,000 records from almost 100,000 individuals representing more than 1,800,000 person-years of observation. The CCLS is one of the most highly-referenced databases containing more than 3,000 variables and the most information on fitness in the world. And so I end where I began. I was first tested for one version of “fitness” when I first became a police officer in 1987. The standards utilized were those most current at the time from the Cooper Institute – at that time in 1987 called the Cooper Clinic. So what do I believe are the takeaways from this article? Glassman wasn’t the first to define fitness. It’s been defined, more similarly than not, to what Glassman provided, for decades. Fitness tests have been measurable, observable and repeatable for decades. There isn’t likely one best “fitness” definition. The Crossfit culture has adopted Glassman’s definition which is performance-related fitness. Many other fitness definitions include things like body composition and blood pressure. It’s hard to argue that a healthy body composition and a healthy blood pressure are not indices of health-related fitness. Most of the Crossfit culture would simply answer that they don’t matter as long as work capacity is strong. However, even Glassman references the importance of a healthy body fat and blood pressure numerous times in his 2002 article. In conclusion I’ll say that I do Crossfit and I enjoy it. While Crossfit, like any modality of exercise, has its faults and limitations, it may, when part of a broader exercise regimen, and in the hands of skilled coaches, produce better-fit individuals than most other training modalities. Endurance enthusiasts are often weak in the muscular strength or flexibility components. Powerlifters are often weak in the flexiblity, body composition and cardiorespiratory components. Bodybuilders are often weak in the flexibility and cardiorespiratory components. I tend to lean toward “Do what you love and stay injury-free.” Regardless of your exercise modality of choice I applaud you for engaging in it. While Glassman isn’t the first to define fitness, the growth of Crossfit has popularized his definition, making it quite likely the most widely known. Let’s just stop the madness where he’s given credit for being the first and only. Glassman has created a hell of an empire and the Crossfit method of training has enough pluses going for it that it doesn’t need to stand on the misinformation too-often being spread on this subject.